Hello Ladies! I hope you have all been enjoying the fantastic weather we've had so far this summer! This Thursday is our August WiN meeting and we will be meeting at the Deer Run Golf Course. 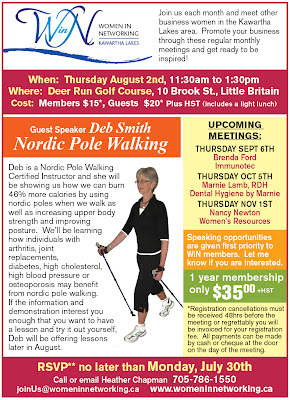 Our guest speaker is Deb Smith, Certified Nordic Pole Walking Instructor. Please let me know this week (Monday at the very latest) if you will be attending the meeting next Thursday and if you plan to join us in a round of golf afterwards (9 holes) on a beautiful course that is perfect for the casual/beginner golfer.... like me. :) It will be a fun afternoon and a great way to end-off the summer in "WiN" fashion! 9 Holes - $20, Push cart - $4, Power cart - $18. Note: if you're up for it, the course is very "walkable". I look forward to seeing everyone on Thursday, full details below.